As research shows that hands on, experiential activity better engages participants, stimulates a higher level of brain activity and improves retention. The use of games and simulations is gathering steam as a more productive technique for education, training and research. Metaari, the leading analyst firm in the industry, is forecasting a 37%+ global CAGR for the next five years, quadrupling revenues to more than $17.1 billion by 2023. 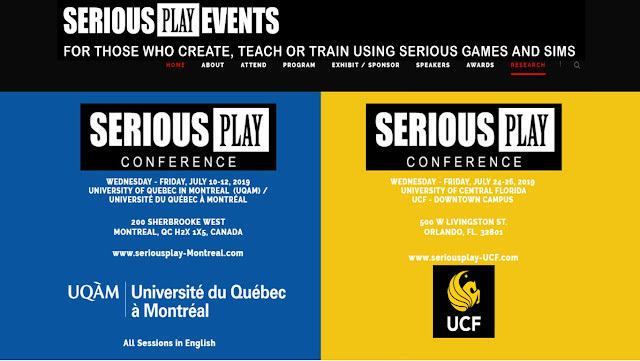 Serious Play Conferences, three-day, practical, experiential learning events now in their 11th year, bring together serious game developers and instructional designers; training directors implementing learning programs in government, corporations and healthcare institutions; K12 administrators and faculty; higher education faculty. Drafts of the 2019 programs will be up by mid-March.